Binance will continue supporting Ripple (XRP) as long as it is a utility. Therefore, with these developments, odds are XRP prices will close above 40 cents and even 60 cents. Pointing out that in the last AMA session someone said he was the leader of the so-called XRP Army Changpeng Zhao has announced that their latest acquisition, Trust wallet, now supports XRP and credit card purchases. Fiat support is possible thanks to Binance partnership with Simplex back in January. The announcement is days after Binance rolled out the first of the kind open source, cross-blockchain Trust Wallet Core allowing interested developers to build decentralized dApps and their version of wallets or adapt wallets to the new platform thereby expanding its capacity. From all indications, it is likely that Trust Wallet—now that it is open source with cross-blockchain capabilities, will be incorporated in the Binance DEX which is in test-net. 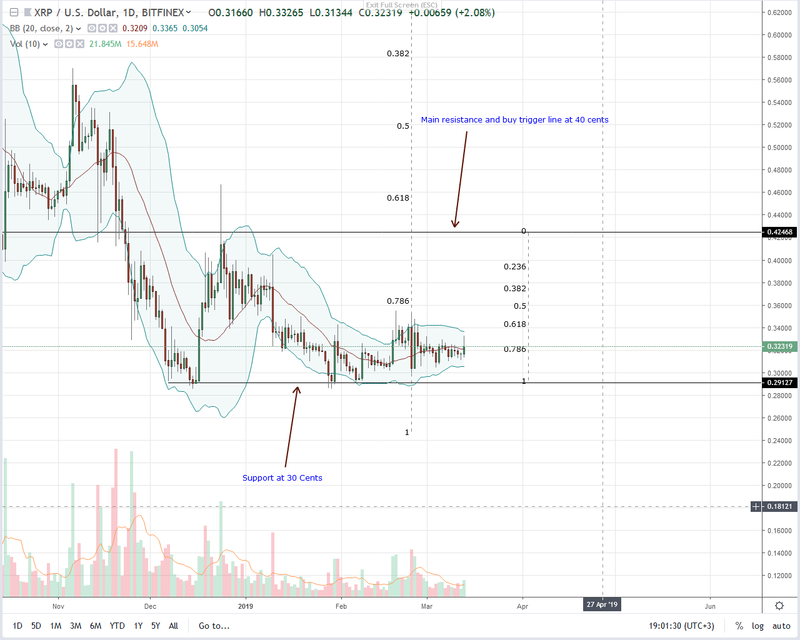 Despite this, Ripple (XRP) prices are flat and trending in a tight trade range. Nonetheless, we are bullish and expect a breakout above 34 cents and 40 cents in days ahead. Founding our optimism are supportive candlestick arrangements and solid fundamentals. In the daily chart, prices are consolidating. Besides, with a flat MA and a BB squeeze, a breakout is on the cards. Additionally, the failure of bears to satisfactorily reverse gains of Feb 25 confirming losses of Feb 24, buyers have the upper hand from an effort versus result perspective. The only way for buyers to be in charge is if prices rally above 34 cents confirming bulls of Mar 5. We expect XRP prices to print higher and confirm the bulls of the London session. However, for trend resumption and momentum building, highs of Mar 5 must be cleared. Blasting these highs should be a bar with high volumes exceeding 14 million average and 18 million of Mar 5.